Hmmmm, here you are and Mother’s Day is just round the corner. Still trawling through the plethora of gift sites wondering what to buy? If you don’t get a move on you’ll find yourself falling back on the aged old favorites of chocolates and flowers once again this year. Whether it’s your maternal mom, your wife, grandmother or daughter, isn’t about time you turned up the anti. Find her the best mothers day gift possible, and you’ll go down in history as being number one. Not that the giving of gifts should be seen as a competition of course, but we know you can’t help a bit of healthy sibling rivalry. While your mum deserves to be pampered and made to feel loved everyday of the year, Mother’s Day is a special celebration just for her. It’s all too easy to fall back on the same old gifts when it comes to your mum. After all what could she possibly need? She’s already got you. Some mums might be content with the same old fare, but surely this lady who has stood beside you for some many years, deserves a little bit extra? Little Green by Joni Mitchell – possibly penned following her experiences of being a 21 year old unmarried mother in 1964. Let it Be by The Beatles – both Paul McCartney and John Lennon both lost their mums at an early age. Coat of Many Colors by Dolly Parton – she bought her mum a mink coat with the royalties from this song. Only One by Kanye West – this song is sung from the perspective of his mum. Hollow by Björk – written about her baby daughter, and how she longs to be joined with other mothers. A personalised key chain – available in a wide variety of colors and designs, you can even buy a set that has a different message, depending on how mum’s feeling. A special vintage map – showing the location of one of her favorite places, and if you don’t know where it is isn’t it about time you asked. A warm and snuggly blanket – for those evening she spends curled up watching her favorite TV series, keeping her warm and cosy when it’s cold outside. An e-book subscription – paperbooks are now a bit old hat, but e-readers seem to have taken the world by storm. If your mum hasn’t got one yet it’s about time she did. Membership to a museum or National Park – she will appreciate this kind of gift because it allows her to spend as long as she likes enjoying all the exhibits. A comfy pair of slippers – for those cold winter nights to keep her toes warm. A stylish weekend bag – perhaps as a hint that she needs to spend more time away enjoying herself, doing the things she likes to do. 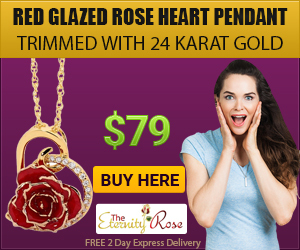 Exquisite items of jewelry – such as those on offer at the Eternity Rose. Did you realise that jewelry is the most popular Mother’s Day gift? According to a recent survey undertaken by March of the Dimes ( a non-profit organisation whose aim is to improve the health of mother’s and babies) jewelry came out as one of the top Mother’s Day gifts. One sad figure they uncovered was that only 26% of those mums they surveyed were even expecting to receive a Mother’s Day gift. That’s quite a poor showing for all you kids out there! When it comes to taking mothers out for dinner, 40% of daughters and 29% of sons, consider this a worthy gift. One touching figure that emerged was that of all the kids that were surveyed, 90% of them considered their mum a friend. Wonder why it is then, that so many mothers aren’t expecting a Mother’s Day gift. We appreciate that time can run away with you, and before you know it this important celebration is knocking at your door. This year however, we hope that the number of mums receiving their top Mother’s Day gifts is set to rise, and many more mums will be smiling with their families by their side. With Mother’s Day just round the corner, it’s time to get your skates on and find such an important woman the best possible Mothers Day gift. Don’t be put off by the myriad of options, make the right choice by going with your heart. If all else fails, you can still cook up a storm in the kitchen and create a meal full of surprises. She’s been cooking hundreds, if not thousands of meals for you and the family, and it’s about time the favor was repaid. We wish all you mothers out there a well earned and memorable Mother’s Day. And for all you gift searchers, it really isn’t as hard as you think.